In the global market for optical brighteners, the top four players account for over half the market share. This makes the competitive landscape consolidated in nature. The four dominant companies operating in the market are BASF SE, Huntsman Corporation, Eastman Chemical Company, and Akzo Nobel N.V. Among them, BASF SE led the market with a dominant share of 22.2% in 2015 mainly on the back of its robust presence in the market and continued thrust on product development. Akso Nobel N.V. followed BASF SE in the second position and Huntsman Corporation and Eastman Chemical Company trailed in the third and fourth positions, respectively, with near identical shares. 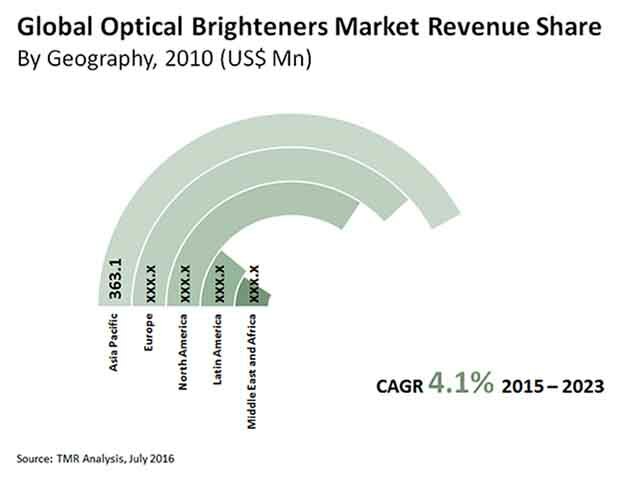 A report by Transparency Market Research predicts the revenue in the global optical brighteners market to attain a value of US$1.71 bn by the end of 2023. It forecasts the market to reach a value of 242.7 kilotons in terms of volume by 2023. Depending upon the types of chemicals, the global market for optical brighteners can be classified into cinnamic acid, stilbene, dicarboxylic acid, coumarin, and diphenyl pyrazoline, among others. Of these, stilbene is the most widely used chemical and holds about two third of the market share. Going forward too, stilbene is slated to see its market rise substantially because of the availability of different derivatives and isomers of stilbene. While the isomers, namely Bith and Cis and Trns are used to manufacture commercial optical brighteners, the derivatives of stilbene, namely triazine-stilbenes and biphenyl-stilbenes find application in commercial grades of optical brighteners. It is trailed by coumarin and diphenyl pyrazoline. From a geographical standpoint, the key segments of the global market for optical brighteners are Asia Pacific, North America, Latin America, Europe, and the Middle East and Africa. Among them, Asia Pacific and Europe are key markets. India and China, whose economies have been clocking maximum growth worldwide, along with Malaysia, Taiwan, and Indonesia are primarily powering the growth in Asia Pacific. This is because of the expanding manufacturing capacities of end use industries of textile, paper, plastic, and detergents. In the years ahead, Asia Pacific is expected to increase its share further to account for 41.6% of the market in 2023. Europe, on the other hand, will likely trim some of its market share despite retaining its second position. At the forefront of driving demand in the global market for optical brighteners is the textile industry and the textile machinery industry, particularly in the countries of India, China, Taiwan, Italy, Turkey, and Mexico. The booming cosmetic industry, especially the colored cosmetics segment, is also bringing about growth in the market. “Optical brightening agents are used in color cosmetics as they absorb light in ultraviolet and violet region of electromagnetic spectrum so that the material looks brighter and cleaner,” explains the lead analyst of the report. In the foreseeable future, the rising use of recycled fiber will present an opportunity for manufacturers of optical brighteners. Already, savvy players are producing optical brighteners that accord superior compatibility with recycled fibers. Countering the global market for optical fibers are regulations against use of various chemicals that find application as optical brightening agents by governments in different nations. “The rules have been framed due to the health hazards associated with optical brightening agents. Some of the optical brightening agents cause eye irritation and skin infections,” explains the analyst of the report. Declining growth of the global paper industry owing to widespread digitization is also hampering growth in the market.